The challenge for the top 10 student fundraisers is underway! 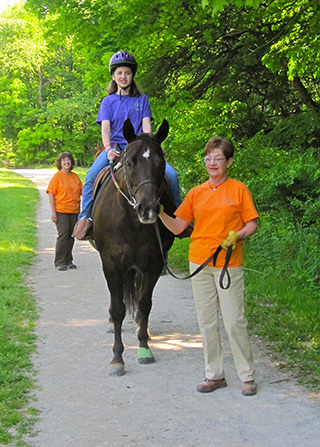 The top 10 fundraisers who raise more than $250 will enjoy a trail ride with one of our therapy horses on the beautiful trails in the South Chagrin Metroparks in Moreland Hills on Sat., May 10. Participants who raise $50 will be eligible to receive a Ride-a-Thon T-shirt and participants who raise $100 will receive a sweatshirt. Those at the $250 level will be eligible to choose from a Visa or Schneider’s Saddlery gift card. To qualify for prizes, individual registration and funds are due in the Fieldstone Farm office by 5 p.m. on April 30. This year we also will have a special used riding apparel sale May 12 through May 16 at Fieldstone Farm. This is a great time for riders to get geared up for the June Horse Show which will be held on Sat., June 21st at Fieldstone Farm. If you would like additional information, please contact Tonya Zimmer at tzimmer@fieldstonefarmtrc.com or 440-708-0013 ext.128. Thank you for your continued support of Fieldstone Farm. See you on the trails!